Jared Unzipped: Random Suds Review: Shiner Ruby Redbird Lager. In 2015, I completed two sets of weekly seasonal beer reviews: the Brew Spew (autumn) and the Yule Grog (winter). With each set of reviews, I took one beer a week for an entire month to task, analyzing their pros and cons. Ultimately, I produced some amazing results with beers I had never tasted before. I figured, why limit such a successful article series to just two months out of the year? At random, I will continue to review new beers on Fridays throughout the entirety of the year. Of course, I will have new installments of the Brew Spew and Yule Grog for 2016. Instead, these upcoming random reviews will not be limited by seasonal availability. If I see a beer that I want to try for the first time and review, then I'll do just that. Appropriately, these reviews will be known as Random Suds Reviews. 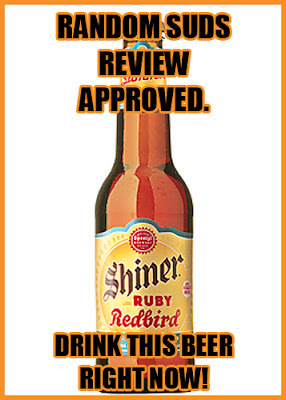 The first Random Suds Review will be the Shiner Ruby Redbird Lager. It is produced by Spoetzl Brewery of Shiner, Texas. 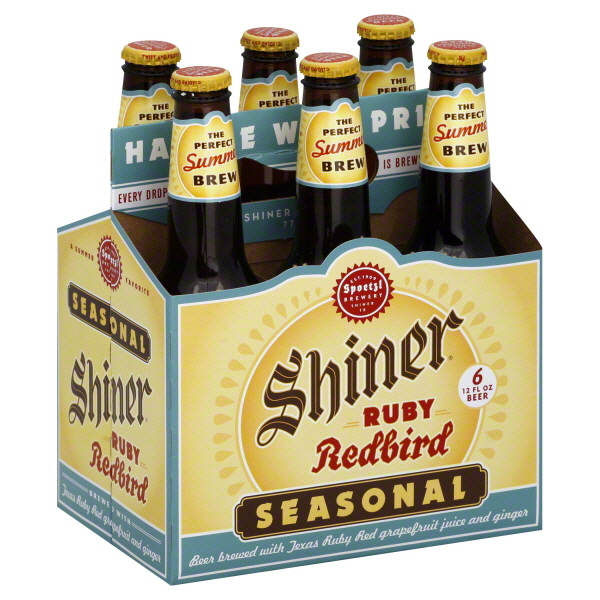 Initially produced in 2011 as a summer seasonal beer, Shiner Ruby Redbird was so successful that it's now available year round. Shiner Ruby Redbird is 4.01% Alc. by volume and brewed with two key ingredients: grapefruit juice and ginger. As with my previous beer reviews, I'll break my taste testing into two segments: cold and at room temperature. Grapefruit odor is very strong. Initial taste is tart but not sour. Very pleasant and wonderful upon first impact on my tongue. The ginger flavor is faintly sweet and removes any bitterness from the grapefruit. Aroma is like a bouquet of fresh citrus fruit, really opens the nose. Doesn't froth in my mouth. No bitter aftertaste upon swallowing. No bitterness that often comes with warmer beer. Sweetness has dropped only slightly. Not much difference in taste with the change in temperature. Very impressed with the consistent grapefruit-filled perkiness! I've enjoyed many other Shiner beers in the past (Holiday Cheer and Prickly Pear to name a few) and the Ruby Redbird continues this trend. This beer is PHENOMENAL! I insist you go out and try the Shiner Ruby Redbird right now. Your tongue will thank you. I finished this review feeling highly impressed!